Image Graphic & Website Design is Macarthur’s first choice when it comes to domain name registration, we manage thousands of domains for businesses of all sizes throughout Campbelltown, Camden, Narellan and surrounding areas. Before registering a name though, you should speak to us and discuss the best options as to the name/s you are thinking of. Many names chosen can increase your websites rank from the start of it being published, this is where we are more than happy to talk to you about the best options you have and we give good professional advice. And we don’t charge you, it is part of our service and we are happy to help. It can be daunting trying to find the domain name that you want for your business. Domain names have been around for many years now and the majority of domain names are taken, even your company name when searched could be taken and you are now wondering “What can I do”? Well fear not as there are many ways to look at an alternative which in fact could be even better for you in the long run. Give us a call on (02) 4647 3111 and we are more than happy to help you out with some free advice. Or simply CLICK HERE and register your own through our online shop. 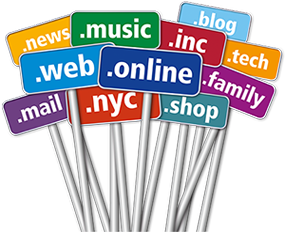 The release of more than 1,000 new gTLDs (generic Top Level Domains) is the biggest shake-up since the internet began. Dot Company, dot Villas, dot Industry, dot Guru – dot Graphics. They’re all up for the taking. This is the beginning of a new digital landscape. Offering your brand the opportunity to grow its digital footprint and to build a domain portfolio that works for you. You may have always wanted to get a suburb or city in front of your .com.au name. Well now you can an example being we have www.imagegraphicdesign.com.au (and a few others) but recently we registered www.macarthur.graphics . These new Top Level Domains are being rolled out weekly, we are constantly watching what is coming and we are letting our customers know in advance. Apart from using them for your own company they could potentially be an investment and you could sell them off at a later date and make a profit. There are many opportunities with these new gTLDs and it only takes a call to us to find out what you can have.